Security threats, particularly those along NATO’s southern and eastern borders, continued to generate a host of new challenges for NATO in 2016. These challenges keep many of us focused on near-term readiness and planning, so it is imperative to have an organization like the JAPCC shaping the transformation of Air and Space Power to meet the challenges anticipated farther in the future. At the same time, the JAPCC fills a second role as NATO’s Air Warfare Centre, and makes substantial contributions to training and major exercises that ensure our near-term readiness. NATO Air and Space Power would not function as effectively and efficiently as it does, without the JAPCC. Put simply, the JAPCC is one of the Alliance’s fundamental enablers. We are also proud to welcome Denmark as a new Sponsoring Nation, and Greece as a returning Sponsoring Nation. Denmark’s expertise in the area of Air Operations Planning was instrumental and will further strengthen our transformation efforts, while the addition of Electronic Warfare expertise from Greece will fill a key gap in the JAPCC’s capability. The addition of Denmark and return of Greece to the JAPCC’s Memorandum of Understanding demonstrates nations are increasingly recognizing the value the JAPCC brings to Alliance Air and Space Power capability. The Nations continue to introduce new and highly sophisticated means, including manned and unmanned platforms. We have yet to recognize either the full potential of these systems or, understand in sufficient detail, the fundamental changes that their introduction will bring to our endeavours. These challenges should be viewed as the catalyst for Transformation, and if we fail to transform, we run the very real risk of failing to deliver when pressed by a current or future adversary. Air and Space Power is the Alliance’s Asymmetric Advantage, and it must be maintained. Whatever the advantages offered by individual new platforms, the true benefit will come from being able to create cohesive effects across the entire spectrum of Joint Operations. To do this, we have to employ the capabilities our nations provide in increasingly innovative ways, and we have to ensure NATO doctrine and training promote interoperability. These capabilities must be employed as one cohesive force, and not a collection of independent units that might be defeated in detail. In the future, we will likely face near-peer adversaries in materiel terms; however, we should always be in a superior position because we have striven to maintain our intellectual advantage. In this context, NATO Air Power cannot simply evolve, it must transform. Therefore, the JAPCC will continue to examine and question the delivery of all capabilities across NATO, in order to provide our senior leadership and key decisionmakers with the intellectual edge. WHEN THE FIGHT COMES, WE WILL WIN AGAINST ANY OPPONENT, WHEREVER AND WHENEVER THEY APPEAR. The JAPCC has been at the forefront of many significant issues facing NATO, helping the Alliance’s military leaders establish and adapt policies and procedures to address challenges, such as the Project ‘Alliance Airborne Anti-Submarine Warfare (ASW) – A Forecast for Maritime Air ASW in the Future Operational Environment’. This work is proving to be foundational to both Allied Maritime Command and several NATO Nations’ efforts to revitalize ASW and Maritime Patrol capabilities. JAPCC’s Programme of Work guides transformation that will allow the Alliance Air Power to master a changing Air and Space domain while remaining responsive to whatever the future may hold. 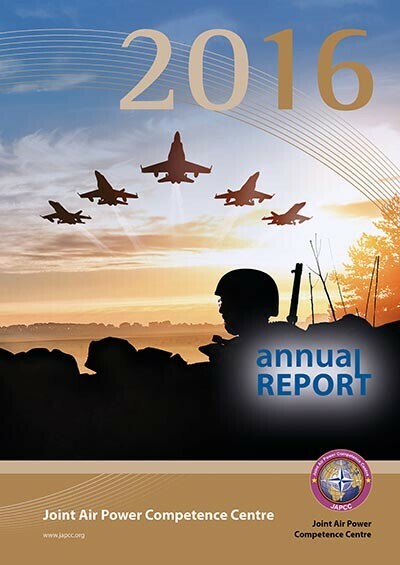 Over the following pages, the 2016 JAPCC Annual Report will highlight the key developments, projects, and research shaping Joint Air and Space Power. We encourage each of you to review the contributions JAPCC is making to the Alliance, and to contact us with questions or requests for support at any time. Good Reading!